Book I: "The Knowledge of God the Creator." Chapter II of Book I: "What It Is to Know God, and to What Purpose the Knowledge of Him Tends." 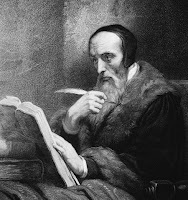 First off, Calvin makes the claim: knowing God is not merely knowing that there is a God, but is also means that we "grasp what benefits us and is proper to his glory....we shall not say that, properly speaking, God is known where there is no religion or piety." So Calvin wants us to know that when we deal with knowledge of God the Creator, it isn't merely knowledge of God's existence or power that constitutes true knowledge. Rather, true knowledge of God must be a knowledge that embraces God in love. Perhaps I'm lurching forward too much in Calvin, but he is essentially speaking of what natural, human piety would look like apart from Christ--but although he doesn't come right out and say it at this point, it is just below the surface that what he is speaking about has never and will never exist. So while this passage could be read as a great description of the way in which man ought to embrace God even apart from Christ (via "general revelation"), I do believe that Calvin is going to be shortly demonstrating that this is a possibility that is no longer possible given our perverted and fallen natures. "I call "piety" that reverence joined with the love of God which the knowledge of his benefits induces. For until men recognize that they owe everything to God, that they are nourished by his fatherly care, that he is the Author of their every good, that they should seek nothing beyond him--they will never yield him willing service. Nay, unless they establish their complete happiness in him, they will never give themselves truly and sincerely to him." Again, I can anticipate where Calvin is going. He is setting up man as he ought to be so he can show man as he really is (law) and only then will he bring man a remedy for his situation (gospel). However, this approach and procedure brings me to wonder if Calvin has stayed true to what he said he would do at the end of chapter I. He said he would start with the knowledge of God and proceed to the knowledge of man second (keeping in mind that the two are not to be thought of separately). Has he done this? I ask because, while chapter II is called "What it is to know God," it seems to have a decidedly anthropological character. Further, this chapter does not really deal in biblical quotations or exegesis, but seems to be working with something like 'general revelation.' There are two ways of interpreting this approach: 1) Calvin is in reality starting with the revelation of God in Christ and this is his exercise in understanding that revelation (fides quarens intellectum), or 2) he really wants to lay a foundation for his theology with a general notion of man. It seems like the former possibility is much more likely. Anyhow, that is probably enough on this chapter. What Calvin's doing and establishing here cannot be seen until we get deeper into the work.